Our discontinued Octagon Parabolic solar cooker will soon be replaced by our next generation combination ClearDome Solar Oven and Water Purifier (left photo of the prototype) that bakes bread in 35 minutes, cooks pasta, beans, meat, chicken and fish in 45-120 minutes heat Pasteurizes (kills harmful microbes) three quarts of questionable fresh water in about two hours, and distills sea water. It can also sterilize medical instruments and catch rain water for drinking. It is so well insulated that meals remain hot in it for at least 3-4 hours after sunset. 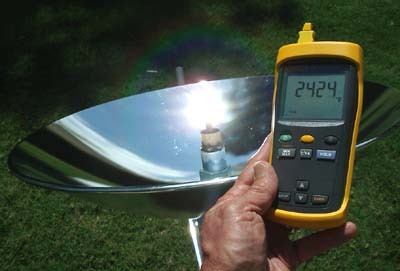 It is the most advanced solar cooker/water purifier in the world. Prototype testing is nearly done, so watch for it here in coming months. When the Octagon Parabolic Cooker was available it came with an optional clear dome pot cover that increased the temperature for boiling water and baking bread. The new design cooker/water purifier has such outstanding absorption and insulating properties that a clear cover is not necessary. It's visible in the photo below of the previous cooker, the SolaReflex 900 sitting in the snow. It allowed you to cook on very cold and windy days by trapping the solar heat. The Octagon Parabolic was quick and easy to setup and use, and as you can see in the right photo, browns meat chicken and fish just as the 900 did--but it does it better and at a lower price. It can even fry bacon and sausage! It's an 8-surface deep-tapered parabolic concentrator that uses our top rated 95.5% reflective SolaReflex AA mirror surface, weather resistant anodized aluminum reflector panel and is fully adjustable to all angles of the sun for more consistant all day heating anywhere on earth. It cooks as fast as the 900 cooker did because all the concentrated reflected sunlight completely covers an 11" cooking pot with over 350 degrees F of midday dry temperature heat, not just a 3" focal point hot spot. It cooks more completely so it's better for cooking all types of food and baking bread. Fried or scrambled eggs will cook in about 12 minutes, while 2-3 pound roasts will be well done and browned in about 60-90 minutes of full midday sunlight, depending on size. Note: Before placing your order, please check for product availability. 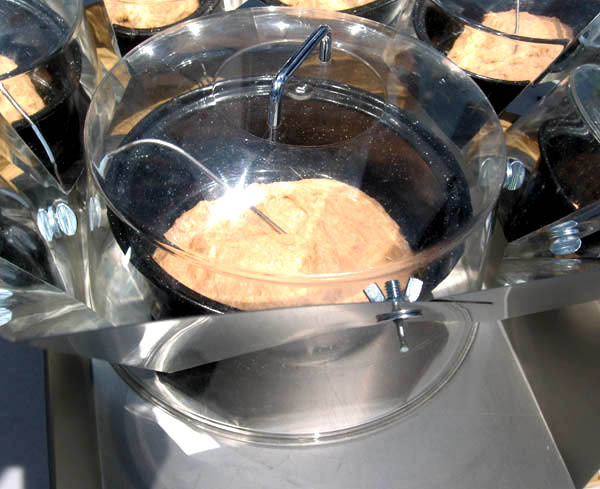 The optional $59 Clear Dome Pot Cover is shown on the right being used for baking bread in the Octagon Parabolic. 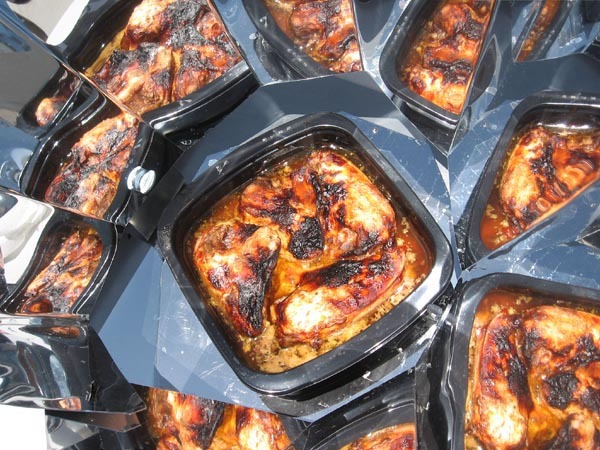 It is ideal for preserving and increasing cooking temps on cold, windy and light cloudy days. We've recently added, at no extra cost, a unique new "heat absorber boost ring" that fits inside the clear pot cover and increases heating temps by another 25 degrees F so you can now fast boil water or bake bread nearly all day long, even on windy or cold summer or winter days. It's made of the same Ultra Blackflex anodized aluminum heat absorber sheets that we use in our top-rated Solar Forced Air (BISFA) heating panels. Another unique optional product solar smokes your food while it's solar cooking without lighting a match or lifting the clear lid. You don't need to burn lots of precious wood to add delicious smoked flavor to your food. 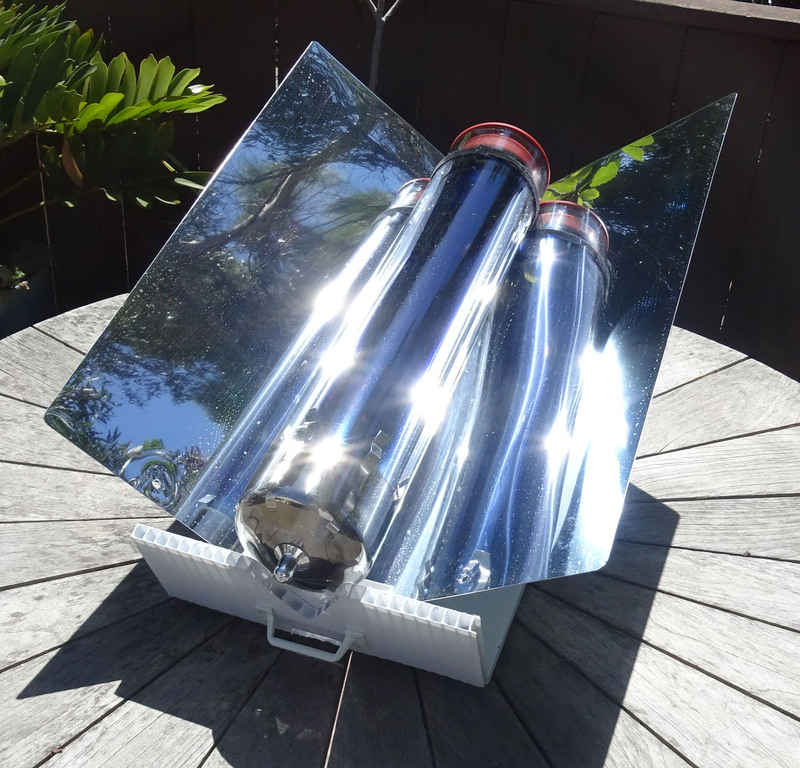 It's our $39 Fresnel Solar Smoker flexible plastic lens that has a long 24" long focal point. This flexible plastic 11" square lens concentrates sunlight into a 1" super hot (1500+ degrees F) focal point that smokes wood chips inside the cooking pot. You only need a tablespoon of chips or food grade wood pellets, placed inside a small aluminum foil cup near or on the food. By hand-holding the lens in full sunlight in front of the cooker, you can send the highly concentrated sunlight directly though the pot's clear glass lid every 15 minutes and lightly burn the wood (no flame needed), filling the air inside with tasty smoke from hickory, mesquite or your favorite cooking wood, as you can see in the photos on the left. In the right close up photo you can see the smoke rising from the hickory wood chips surrounded by a small hand-formed aluminum foil cup. A food thermometer probe (not inluded with cooker) is seen protruding from the hole in the center of the glass lid where a screw-in knob use to be secured. This provides exact food temperature readings. Also in the works is a Solar distilling container that easily fits into the center cooking position on the base. It transforms any foul or salt water into ultra pure drinking water, and as added feature, will also distill wine into brandy, and add the pure essence of any herb, spice or flower to your pure distilled water or spirits as the water vaporizes. This is a higher temperature distiller than our Solar Still Water Purifier that will vaporize water or alcohol at around 170 degrees F. One pint of fluid can be distilled per day. For you solar cookers and survivor planners that want the perfect way to keep on cooking, baking, and Pasteurizing water long after the sun goes down and on cloudy days, we'll soon be introducing a unique new design portable and lightweight outdoor biofuel cooker that uses a very inexpensive, clean burning waste product--compressed sawdust-- as the fuel. It's perfect for use at home, on camping and backpacking trips, and in emergencies. It's called the Wood Pellet Camping and Survival Stove and unlike the large, expensive pellet stove home heaters and small cookers that require power for the fan and auger that feeds pellets into the fire, ours needs no power, fan or auger and boils a quart of water in about 7-9 minutes or two quarts in 12-15 minutes. 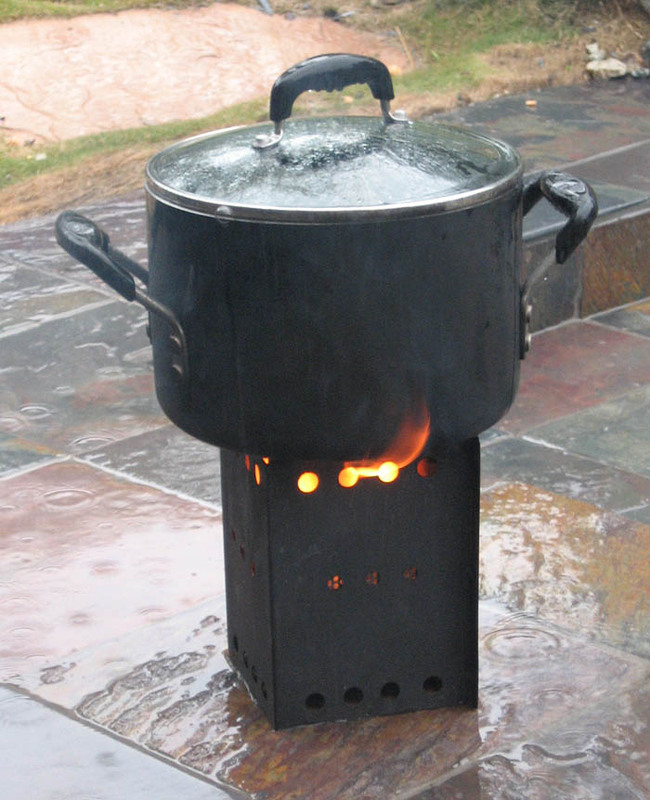 It also cooks on light rainy days, shown in the photo on right, in light to moderate winds, and only weighs two pounds and measures 5" by 7" tall. It is the first commercially produced portable wood pellet cooker that does not require a fan and power supply. If you run out of wood pellets, it can also burn small pieces of dried branches, twigs, seed pits, bamboo or chunks of scrap wood, but it's not as efficient or as hot and it smokes more. far more efficient and safer for cooking than a open camp fire. Normal hard wood pellets burn at about 1,500 degrees F in our stove, while scrap wood and twigs are about 400 degrees cooler, and sootier. By the way, a 40 pound bag of wood pellets only costs about $7 and will cook nearly two months of meals! This makes it well-suited for developing nations or in major disastors where cooking fuel is often too expensive and hard to find. We're even working on a collapsible version for more portability. It will bake bread, potatoes, pop popcorn, bbq delicious steaks in flat pans, wok veggies and meats, and cook perfect rice. It easily Pasteurizes two gallons of water with one cooker, and when two stoves are positioned side by side, it will Pasteurize four gallons quicker. Our prototype cookers are nearly finished being tested and we're projecting spring availability. It's like cooking on your kitchen stove or gas camping stove, but the fuel is much cheaper or free and you're always outdoors. Our new Pellet Camp stove uses only 1/2 cup of pellets to cook eggs or a meal for two, a cup to boil 1-2 quarts (or liters) of water or food, or two cups to cook a 3-4 quart large family meal. More pellets can be added to continue cooking for longer times. Wood pellets offer twice the cooking time as the same amount of uncompressed wood, and they burn much cleaner since they are made of pure sawdust from good quality wood that has been pre-dried and compressed--with no additives. Instead of hauling it off to landfills, it's processed and made into a high quality dry biofuel product. That way, more trees don't need to be cut down, which helps the environment. Check back on our new Pellet Camp Stove web page by clicking here for more details and photos. 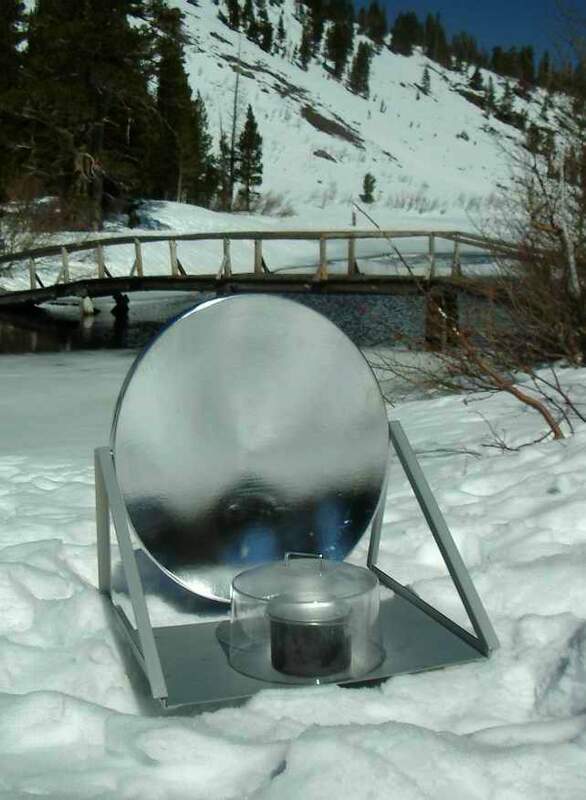 Here's a photo of our previous generation SolaReflex 900 solar cooker, seen solar cooking on snow, that helped inspire the creation of the top rated Octagon Parabolic Solar Cooker. And we're now selling an even hotter center focus metal 24" parabolic solar reflector with a 6" focal point hot spot 1/4" round that reaches over 2,800 degrees F! 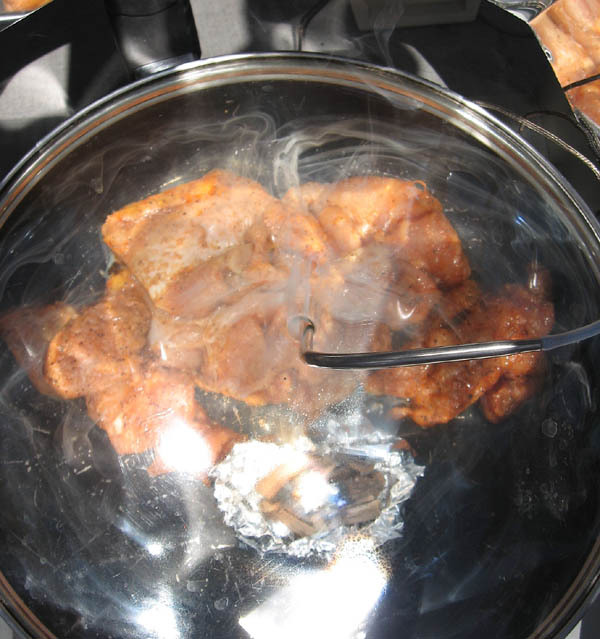 It's also not designed for solar cooking because it will melt aluminum, copper and brass and is designed for scientific/industrial/educational uses. The calibrated Fluke thermometer shows 2,424 degrees F at the super bright hot spot to the left, and the temp kept rising and maxed out the thermometer at 2500F. 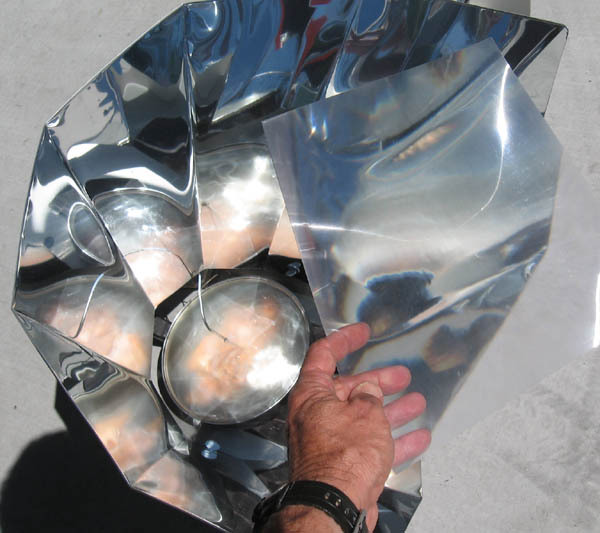 It's called the SolaReflex 2800SA Spun Aluminum parabolic reflector because the inside of the sturdy spun aluminum dish is highly polished, then specially coated with our 97% reflective SolaReflex surface coating. A patented rock-hard invisible transparent protective coating is then applied for many years of outdoor use. 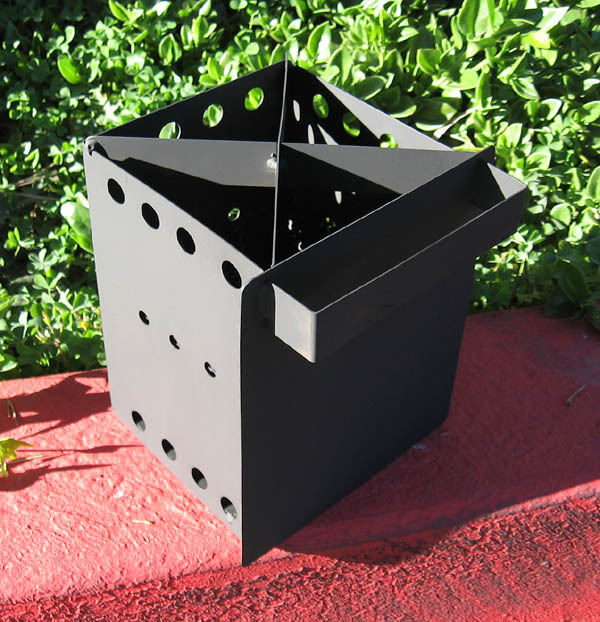 A support stand and solar tracker is not included, but there is a 1.5" mounting hole at the low point in the dish. For more details on the 2800 spun aluminum heat reflector, please click here to email questions to solar heating designer Deris Jeannette. Sorry, this extreme solar heating reflector is not available to the general public, but if your business or school needs to generate extremely high temperatures from sunlight for scientific, survival or educational uses, it is available to order for $349 once you are pre-approved by email. Questions? click here to email solar heating designer Deris Jeannette. Please browse our home page at http://www.cleardomesolar.com/ for more information about all of our unique solar heating products, including our BISFA solar forced air heaters, Solar Heating Drapes, CoolTarp and other unique solar thermal products. ÃƒÆ’Ã†â€™Ãƒâ€ Ã¢â‚¬â„¢ÃƒÆ’Ã¢â‚¬Â ÃƒÂ¢Ã¢â€šÂ¬Ã¢â€žÂ¢ÃƒÆ’Ã†â€™ÃƒÂ¢Ã¢â€šÂ¬Ã‚Â ÃƒÆ’Ã‚Â¢ÃƒÂ¢Ã¢â‚¬Å¡Ã‚Â¬ÃƒÂ¢Ã¢â‚¬Å¾Ã‚Â¢ÃƒÆ’Ã†â€™Ãƒâ€ Ã¢â‚¬â„¢ÃƒÆ’Ã‚Â¢ÃƒÂ¢Ã¢â‚¬Å¡Ã‚Â¬Ãƒâ€šÃ‚Â ÃƒÆ’Ã†â€™Ãƒâ€šÃ‚Â¢ÃƒÆ’Ã‚Â¢ÃƒÂ¢Ã¢â€šÂ¬Ã…Â¡Ãƒâ€šÃ‚Â¬ÃƒÆ’Ã‚Â¢ÃƒÂ¢Ã¢â€šÂ¬Ã…Â¾Ãƒâ€šÃ‚Â¢ÃƒÆ’Ã†â€™Ãƒâ€ Ã¢â‚¬â„¢ÃƒÆ’Ã¢â‚¬Â ÃƒÂ¢Ã¢â€šÂ¬Ã¢â€žÂ¢ÃƒÆ’Ã†â€™ÃƒÂ¢Ã¢â€šÂ¬Ã…Â¡ÃƒÆ’Ã¢â‚¬Å¡Ãƒâ€šÃ‚Â¢ÃƒÆ’Ã†â€™Ãƒâ€ Ã¢â‚¬â„¢ÃƒÆ’Ã¢â‚¬Å¡Ãƒâ€šÃ‚Â¢ÃƒÆ’Ã†â€™Ãƒâ€šÃ‚Â¢ÃƒÆ’Ã‚Â¢ÃƒÂ¢Ã¢â€šÂ¬Ã…Â¡Ãƒâ€šÃ‚Â¬ÃƒÆ’Ã¢â‚¬Â¦Ãƒâ€šÃ‚Â¡ÃƒÆ’Ã†â€™ÃƒÂ¢Ã¢â€šÂ¬Ã…Â¡ÃƒÆ’Ã¢â‚¬Å¡Ãƒâ€šÃ‚Â¬ÃƒÆ’Ã†â€™Ãƒâ€ Ã¢â‚¬â„¢ÃƒÆ’Ã‚Â¢ÃƒÂ¢Ã¢â‚¬Å¡Ã‚Â¬Ãƒâ€šÃ‚Â¦ÃƒÆ’Ã†â€™ÃƒÂ¢Ã¢â€šÂ¬Ã…Â¡ÃƒÆ’Ã¢â‚¬Å¡Ãƒâ€šÃ‚Â¡ÃƒÆ’Ã†â€™Ãƒâ€ Ã¢â‚¬â„¢ÃƒÆ’Ã¢â‚¬Â ÃƒÂ¢Ã¢â€šÂ¬Ã¢â€žÂ¢ÃƒÆ’Ã†â€™ÃƒÂ¢Ã¢â€šÂ¬Ã‚Â ÃƒÆ’Ã‚Â¢ÃƒÂ¢Ã¢â‚¬Å¡Ã‚Â¬ÃƒÂ¢Ã¢â‚¬Å¾Ã‚Â¢ÃƒÆ’Ã†â€™Ãƒâ€ Ã¢â‚¬â„¢ÃƒÆ’Ã¢â‚¬Å¡Ãƒâ€šÃ‚Â¢ÃƒÆ’Ã†â€™Ãƒâ€šÃ‚Â¢ÃƒÆ’Ã‚Â¢ÃƒÂ¢Ã¢â‚¬Å¡Ã‚Â¬Ãƒâ€¦Ã‚Â¡ÃƒÆ’Ã¢â‚¬Å¡Ãƒâ€šÃ‚Â¬ÃƒÆ’Ã†â€™ÃƒÂ¢Ã¢â€šÂ¬Ã‚Â¦ÃƒÆ’Ã¢â‚¬Å¡Ãƒâ€šÃ‚Â¡ÃƒÆ’Ã†â€™Ãƒâ€ Ã¢â‚¬â„¢ÃƒÆ’Ã¢â‚¬Â ÃƒÂ¢Ã¢â€šÂ¬Ã¢â€žÂ¢ÃƒÆ’Ã†â€™Ãƒâ€šÃ‚Â¢ÃƒÆ’Ã‚Â¢ÃƒÂ¢Ã¢â€šÂ¬Ã…Â¡Ãƒâ€šÃ‚Â¬ÃƒÆ’Ã¢â‚¬Â¦Ãƒâ€šÃ‚Â¡ÃƒÆ’Ã†â€™Ãƒâ€ Ã¢â‚¬â„¢ÃƒÆ’Ã‚Â¢ÃƒÂ¢Ã¢â‚¬Å¡Ã‚Â¬Ãƒâ€¦Ã‚Â¡ÃƒÆ’Ã†â€™ÃƒÂ¢Ã¢â€šÂ¬Ã…Â¡ÃƒÆ’Ã¢â‚¬Å¡Ãƒâ€šÃ‚Â© 1999-2015, ClearDome Solar Thermal, 3268 Governor Dr, #153 San Diego, CA 92122 U.S.A.